Waiting in the wings is an untapped power that can transform the craft of preaching. It isn’t studied or taught because it has been mistaken as trivial or simply the means to get a laugh. What is this ignored superpower? The art of stand-up comedy. 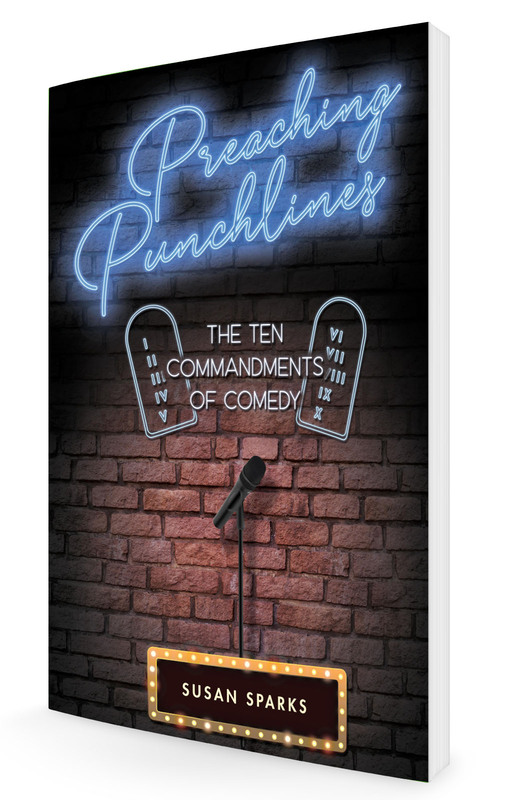 In Preaching Punchlines: The Ten Commandments of Comedy, Susan Sparks brings two decades of experience as a preacher and a professional stand-up to mine the strategies comedians have employed for years. Lessons include framing messages that people will listen to, remember, and share; finding your creative voice; building bridges and community; and bringing full authenticity in the pulpit. The art of stand-up comedy is not just about jokes; it’s about developing intimacy, honesty, and trust—three dynamics that must be present before any sermon is truly heard. How many preachers ever think, ‘My congregation deserve joy’? But that’s the key question that Susan Sparks puts to us in this lively, practical and searching book, which will make seasoned(i.e. jaded) preachers think again and look at what is demanded of them in what ought to be the joyful role of communicating the divine comedy of healing and transfiguration. A preacher with a motorcycle, cowboy boots, a wicked sense of humor and a heart that warms you like a huge southern style breakfast. That’s my pastor! The amazing Susan Sparks has come down from the mountaintop carrying two stone tablets with 10 comedy commandments just for preachers (there were 15, but unfortunately she dropped a tablet). Susan has beautifully distilled exactly how to bring more humor, warmth, joy, and impact to our sermons. This is the most fun book on preaching you’ll ever read! Preaching Punchlines: The Ten Commandments of Comedy is Susan Sparks at her best in blending grace-filled faith and laughter. She reminds us that worship should be and can be a joyful experience. Preaching Punchlines is packed full of practical advice and words of wisdom about using humor to connect with congregations, embracing creativity in preaching, and framing sermons so that people will listen, remember, and share. Susan Sparks is a beloved preacher and nationally known speaker thanks to her skill wrapping wisdom in humor. In her newest book, Preaching Punchlines, Susan — well — preaches what she practices! Susan Sparks is a refreshing voice of hope in a time of doubt and of humor in a time of angst. While not denying the shadowy sides of life, her bright and bold perspective consistently helps us locate the Light. A don’t miss read for preachers … and everybody else who needs a faith lift! Religion is too important to leave in the hands of the joyless. In Preaching Punchlines, pastor and stand-up comedian Susan Sparks teaches us to use laughter to shatter our defenses and open our hearts. This is a book for anyone who knows that laughter and love work best when they work together. Buy Now Pre-Orders Now Open!